The quality of this costume is great. Also, the information from size table was accurate. It arrived on time from USA to Romania, with no delay or any other problems. 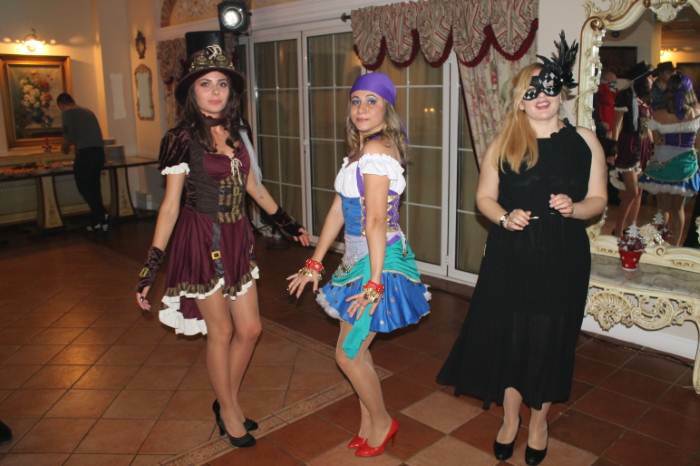 The costume was complete, like in the picture (without boots and tutu) but even without tutu it looks great and also very comfortable. Was this review helpful to you?YesNo8 people thought so and 1 didn't. Highly recommended ! Fits perfect, very comfortable. Liked it a lot and got a lot of compliments!!! Wasn't sure what my costume would be until a couple of weeks before. First, a mermaid, but didn't fit in the "tail" skirt. Saw this and really liked it. When it came, I tried it on and it looked really good and fit like a glove (bought the 8/10). I bought the petticoat to go with it even though I have black tutus from ballet; the one that came was the high/low one. I bought the gators to go over my boots separately and they looked OK, but were hard to keep up with the garters that had nothing to hold onto. It still worked overall, though. I didn't like the white rope changed out the one on the hat, but didn't get to the dress itself. In the picture, I'm wearing round old-fashioned glasses that didn't stay on very well, but was fun for pictures. The "gun" is from the dollar store. Many compliments and would love to wear it again somehow. It would be good to wear over a "real" steampunk skirt to be more authentic. The tulle in the shoulders was a little itchy, but overall very comfortable. 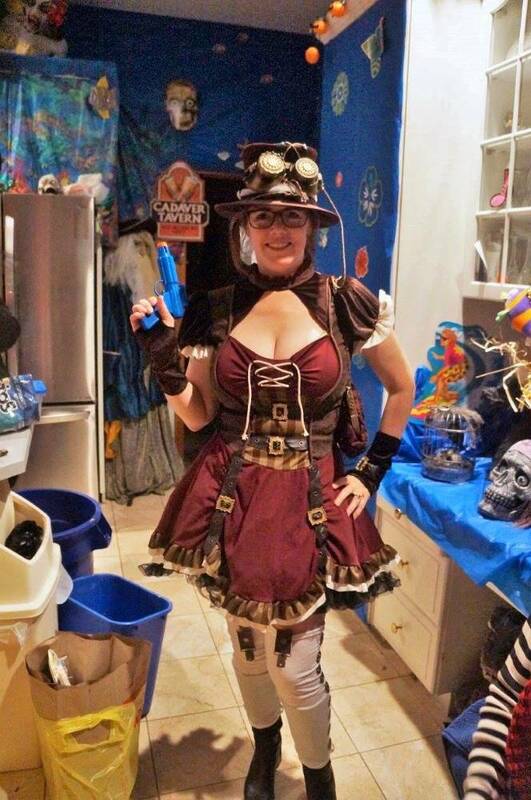 This steampunk costume was awesome and turned heads at a couple of different parties. The costume got many compliments for its authenticity and high-quality look. I loved the fact that the costume was complete (everything except the petticoat and boots were included); comfortable; and reasonably priced. I highly recommend this costume! My order came 5 days earlier than promised, which was great all by itself. Then the costume fit really well based on their size chart. I bought one size up from my normal size because of the measurements. The costume itself appears to be made quite well and the best part was that when I put it on everyone thought I looked totally awesome! With my tall brown boots, this is a winner! 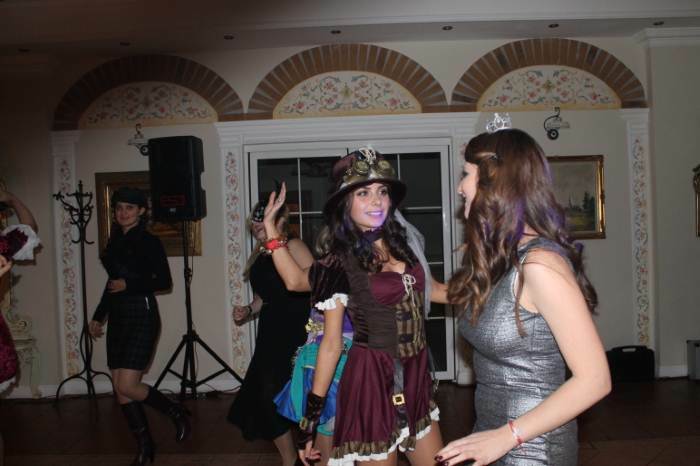 The costume fit me perfectly for once! I’m petite and it’s been a nightmare to find one that works. It comes with all the accessorizes that are listed! Hat is perfect. Wish people knew what a steampunk is tho! And it arrived in plenty of time. SHE WILL LOOK GREAT AT THE PARTY..
Great Costume but.... the front length is off. I think that this costume is great. I order the XS and the front length on here says 31" but in realty it is about 10" shorter, I now need to find something to go under it to make it appropriate to wear to a child's Halloween birthday party this weekend. This was a perfectly good costume but I would have preferred better "leather' bindings and a pop up top hat. It couldn't hold it's shape.